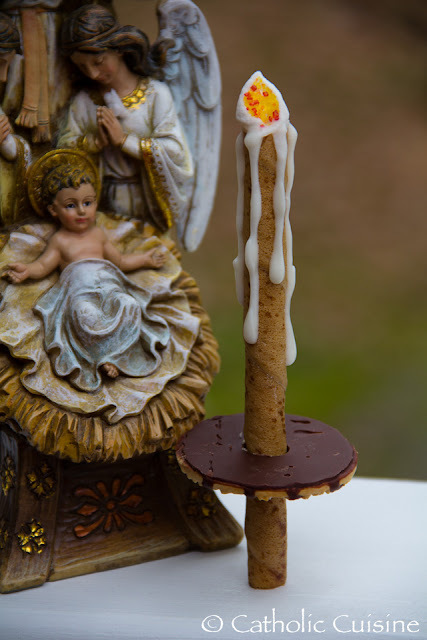 Traditionally called Candlemas, candles are blessed on this day to help us remember the words of holy Simeon who called the babe in his arms, "A light to lighten the gentiles and the glory of your people, Israel." 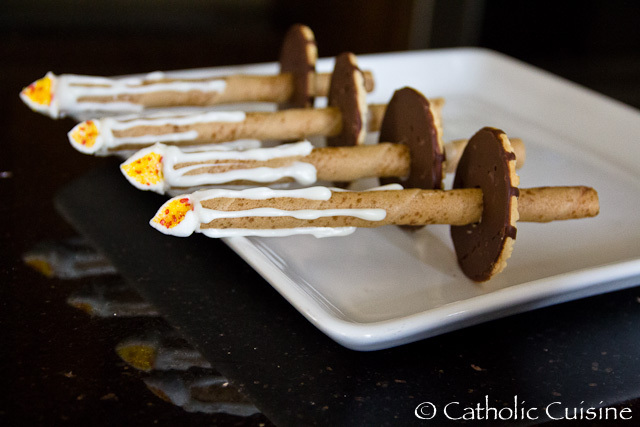 This year I decided to try and make our Candlemas Cookies with Drip Plates! They were so easy to make and turned out great! I think this is my favorite version yet, and it is definitely one of the easiest. Prepare the candle flames using marshmallows and sprinkles. 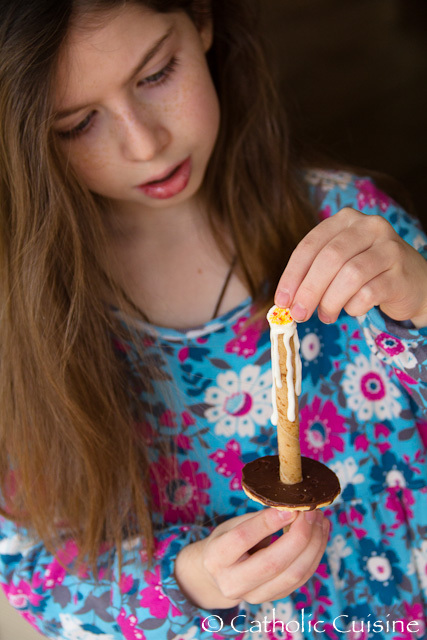 It is easiest to use one mini marshmallow to create two flames, by slicing the marshmallow diagonally and then dipping the exposed sticky center into the sprinkles. 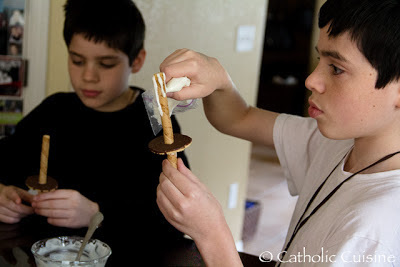 I was out of mini marshmallows, but was able to use just one large marshmallow (cutting corners off at an angle) to create the six flames I needed. Melt the white candy melts and stir. 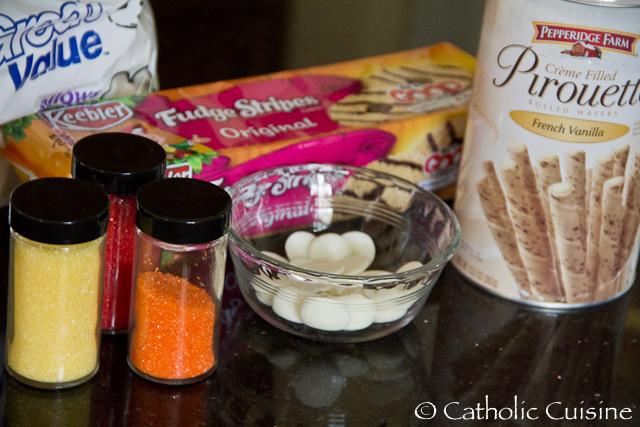 Fill a small baggie with the melted candy and snip off a corner. 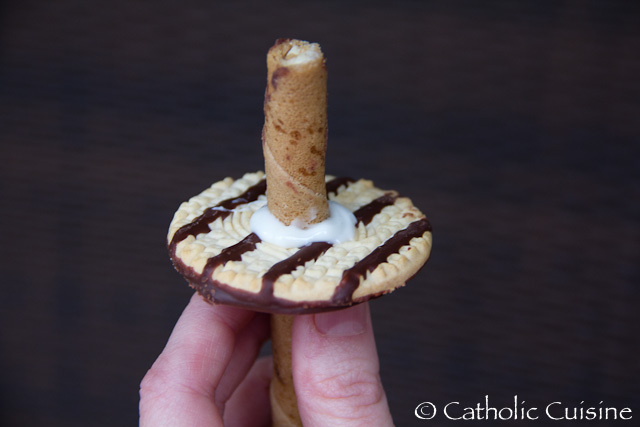 Prepare the cookies by inserting one of the Pirouette Cookies into the hole of one of the Fudge Stripes cookies. We choose to have the stripes facing downward. 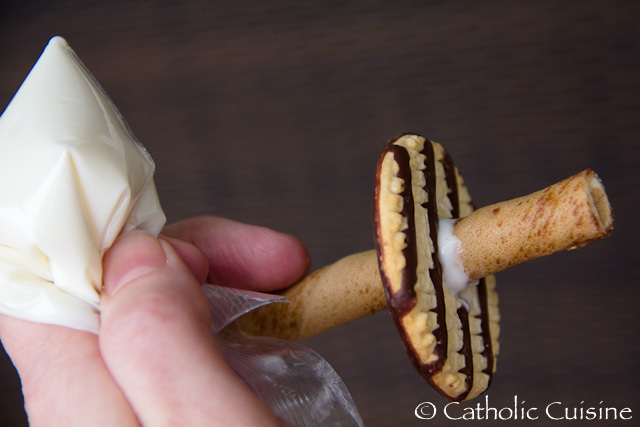 Squeeze a little of the white candy around the bottom of the hole in the cookie, which will attach the two cookies together once the candy hardens. 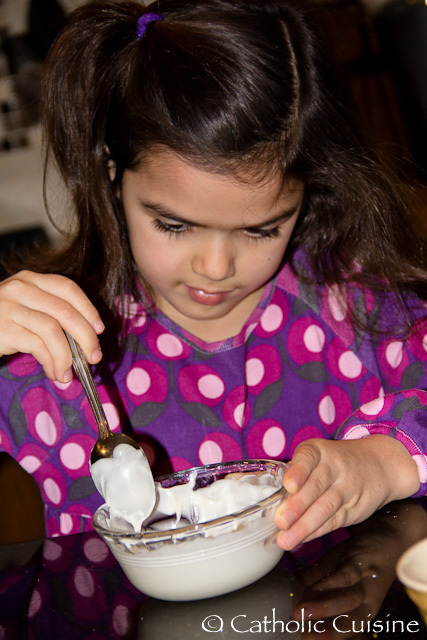 Add white candy drips down the edges of the Pirouette Cookie to create "wax drips." With a dab of white candy on the top of the cookie, attach the marshmallow "flame." TIP: If the white candy hardens inside the baggie before you are finished just pop it back in the microwave. 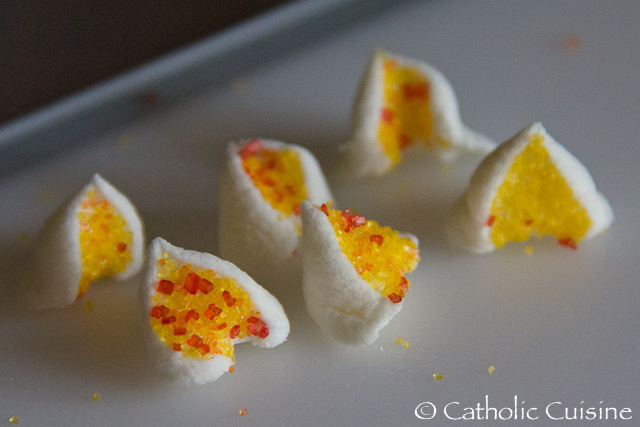 Hold the cookie for a few minutes to allow the white candy to harden. Don't forget to save the rest of the Pirouettes to make some of Charlotte's St. Blaise's Cookies tomorrow! And this is just one of the many reasons your blog is our favorite! 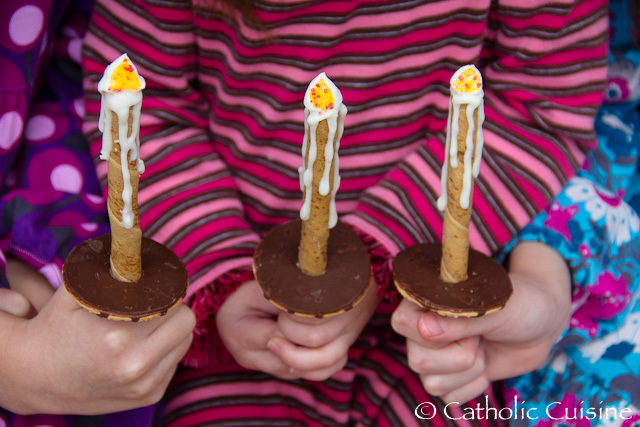 These candlemas cookies are just too cute, creative and clever! Very cute! I also love your awesome statue! Do you by chance have a link to where it can be purchased? These are just too cool! 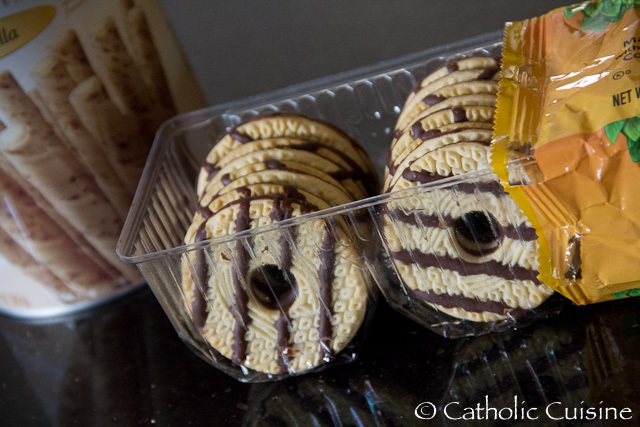 A Healthy St. Valentine's Day Treat!